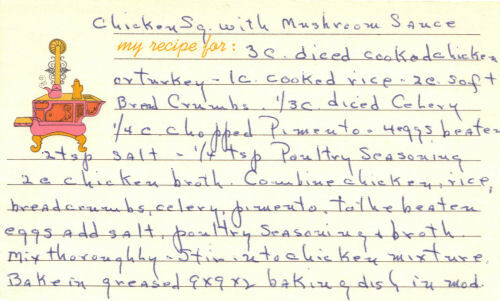 This handwritten recipe was found in a large collection, date unknown. I’ve typed it out below along with a scanned copy (front only). Combine chicken, rice, breadcrumbs, celery, pimento. To the beaten eggs add salt, poultry seasoning & broth. Mix thoroughly. Stir into chicken mixture. Bake in greased 9x9x2 baking dish in mod. oven 350° for 55 min. Cut in squares & serve with cream of chicken soup with added mushrooms.